Being the defending champions is no easy task. After winning the fourth edition of the Indian Super League, expectations were high. However, Chennaiyin FC quite inconceivably has endured a calamitous campaign with John Gregory’s men putting up a shambolic defence of their crown. Gregory’s team has finished bottom of the pile after accumulating a measly 2 wins and suffering 12 losses from their 17 games this season. But that hasn’t compelled the owners to press the panic button. Gregory probably feared the worst when, in a recent press conference, he insisted that his position at the club would have been untenable if the ISL had a relegation and promotion system. “If there was relegation, I don't think I would be here now, to be fair. If relegation ever comes to the ISL, it will change the owners' views, I am sure, on wanting to stay in the top division. You see what happens all across Europe. Many teams change their coaches, their backroom staff, playing style year after year to stay in the Premier League.” he said. “The owners need to protect their investment. If that ever was to come here, I am sure you would see that, certainly with coaches and staff in wanting to change them regularly,” Gregory added. Gregory, so relaxed and affable, has understandably looked strained this term and has often tinkered with his side to try to find a solution to the club’s floundering campaign. A few of Chennaiyin FC’s star performers from 2017-18 campaign- Henrique Sereno, Bikramjit Singh, and Dhanpal Ganesh have been sorely missed this term. Bikramjit Singh and Dhanpal Ganesh were an important cog in Chennaiyin's defensive set up last time around. Dhanpal Ganesh had the third-most tackles among Indian midfielders with 44 in 17 games. He also had 22 interceptions to his name. To add to that, Bikramjit made 37 tackles and 15 interceptions and formed a good partnership with Dhanpal in midfield as the duo proved effective in shielding the defence. Without Dhanpal and Bikramjit, Gregory has tried various combinations in midfield without much success. John Gregory has repeatedly rued the absence of former Portuguese centre-back Henrique Sereno. His departure has left a huge hole in Chennaiyin’s fuselage and his replacements have not overly impressed. While the side had kept a total of eight clean sheets and conceded 19 goals on its way to the title last season (1.05 per game), this season Gregory’s men have conceded 31 goals in 17 games (1.82 per game). An easy assumption to make this season is that Chennaiyin is weak defensively, with goals leaked at an alarming rate. Another major problem for Chennaiyin this season has been Jeje Lalpekhlua’s poor form and the absence of a prolific goal-getter up top. Jeje’s alternative Carlos Salom has also failed to impress and cut a frustrating figure up front. Despite Chennaiyin’s possession and passing stats being high, they have scored only 16 goals so far- the lowest in the league. Goal scoring shyness is a serious concern, in fact, it is the team's Achilles heel. One could argue that John Gregory is capable of turning things around next season if he can plug the holes and buy the right foreign players. Chennaiyin could look at Brazilian international Pedro Geromel of Gremio as Henrique Sereno’s replacement for next season. Sereno and Pedro Geromel played together for Vitória de Guimarães in Portugal. In May 2018, Geromel was selected for the FIFA World Cup in Russia. John Gregory’s Chennaiyin could also look at some unheralded stars from the I-League. Trinidad and Tobago internationals - Willis Plaza and Marcus Joseph have caught the eye of many big teams this season. The duo could add a different impetus to Chennaiyin’s attacking game-plan. And not to forget, influential midfielder Dhanpal Ganesh’ s comeback from injury would provide much-needed solidity in midfield. In all fairness, despite a disastrous season, Chennaiyin has assembled a formidable and promising squad. Several promising youngsters have been acquired keeping in mind club’s long-term interests. John Gregory’s Chennaiyin does not need a major overhaul but needs to bolster a few departments. NorthEast United FC has proved this season that with the recruitment of right foreign players, a team can rise like a phoenix from the ashes. 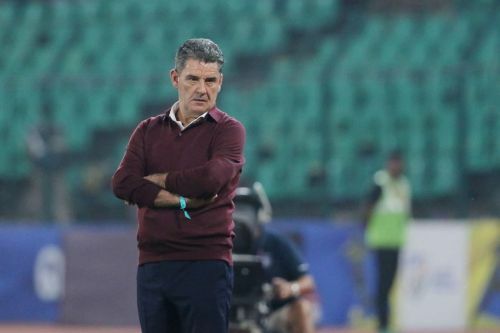 Undoubtedly, John Gregory has the quality and pedigree to revitalize Chennaiyin FC. Chennaiyin fans will never forget John Gregory’s role in the title-winning campaign of 2017-18, but it remains to be seen whether the club’s top brass is willing to repose faith in his abilities once again for the upcoming season.